It's Raining Bats and Frogs by Rebecca Colby, illustrated by Steven Henry. A young witch is determined to make the witch parade run smoothly, despite the sudden rain! I will post a more in-depth review on this one in my Halloween book spotlight! If I Had a Gryphon by Vikki VanSickle, illustrated by Cale Atkinson. I will review this book more in-depth soon, but for now... it's just gorgeous. The story is fun because of all the mythological creatures, but the illustrations are so beautiful. Kids will love this one! Explorers of the Wild by Cale Atkinson. This is a beautifully illustrated book about two very different explorers who bump into each other in the wild. They bond over their love of adventures and form a friendship. I can't say it enough - GORGEOUS illustrations. How Martha Saved Her Parents From Green Beans by David LaRochelle, illustrated by Mark Fearing. My son and I loved this book about how refusing to eat your veggies can save you...but it's a necessary evil. See also: The Lima Bean Monster by Dan Yaccarino. Little Big by Jonathan Bentley. This is a cute book about a baby who dreams about everything he could do if he was bigger. 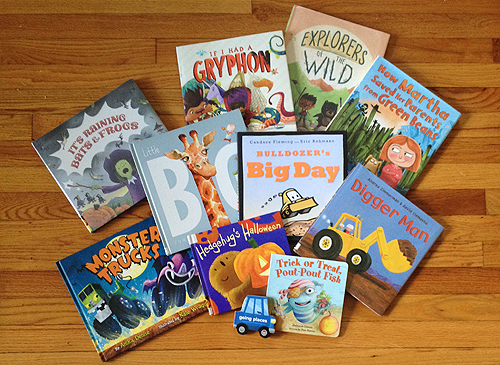 Bulldozer's Big Day by Candace Fleming and Eric Rohmann. Bulldozer is excited to invite his friends to his birthday party, but everyone is too preoccupied with work to even recognize what a special day it is! My son and I love these cute illustrations, and try to identify which machine is which before the text tells us. I really like the black outline on the pages, too - it seems pretty unique for a picture book. Digger Man by Andrea Zimmerman and David Clemesha. My son loved this book about a boy who dreams of being a digger man when he grows up. It was fun to point out the different machines in the illustrations of construction sites. Monster Trucks by Anika Denise, illustrated by Nate Wragg. This is a re-read for us, but it's been a favorite the past few weeks. This one will be reviewed in my Halloween spotlight post! Hedgehog's Halloween by Benn Sutton and Dan Pinto. Cute book about Hedgehug's trouble finding the perfect costume. This book will be reviewed in more detail on my Halloween spotlight post! Trick or Treat, Pout-Pout Fish by Deborah Diesen, illustrated by Dan Hanna. We always look forward to Pout-Pout Fish books, but this one was a bit disappointing. The story was very short, and Pout-Pout was a minor character, so there wasn't too much recognition for younger kids. Kids who have loved all of Pout-Pout's books might like the inside jokes of finding hints of Pout-Pout in the pages, but there's not enough to really carry the story. Going Places. This book actually came from a Wendy's happy meal...go ahead, judge away! Sometimes you can't deny the call of fast food on a Saturday night. The book is actually really cute, since my son is into cars right now, and this is really simple but nice.